Roughness is an important parameter when trying to find out whether a surface is suitable for a certain purpose. Rough surfaces often wear out more quickly than smoother surfaces. Rougher surfaces are normally more vulnerable to corrosion and cracks, but they can also aid in adhesion. A roughness tester is used to quickly and accurately determine the surface texture or surface roughness of a material. A roughness tester shows the measured roughness depth (Rz) as well as the mean roughness value (Ra) in micrometers or microns (µm). Measuring the roughness of a surface involves applying a roughness filter. Different international standards and surface texture or surface finish specifications recommend the use of different roughness filters. For example, a Gaussian filter often is recommended in ISO standards. If you have any questions, please contact us at or +44 (0) 2380 987 035 for PCE Instruments UK, or at or +1 (561) 320-9162 for PCE Americas Inc. This handy product is a mobile roughness tester in the Hommel Etamic series from Jenoptik. This mobile roughness tester is particularly well suited to take quick roughness measurements on machines. The Roughness Tester PCE-RT 10 is a small, light device with simple navigation. Despite the fact that the device functions on a very complex and elaborate level, the measurement results can be acquired quickly and in an accurate way. Very simple to operate with a motorized diamond sensor. The Roughness Tester PCE-RT 10-ICA is a small, light device with simple navigation. Despite the fact that the device functions on a very complex and elaborate level, the measurement results can be acquired quickly and in an accurate way. Very simple to operate with a motorized diamond sensor. The Roughness Tester PCE-RT-11 is a portable measuring instrument for determination of surface roughness according to Ra, Rz, Rq and Rt in just one device. The small roughness tester is especially designed for fast measuring of roughness. The Handheld Roughness Tester is used to determine surface roughness. The compact surface roughness tester is a handheld device for mobile use. Due to the power supply via a powerful battery, it can be used directly on site. The handheld roughness tester is used in the laboratory, in production and everywhere where the roughness of surfaces is to be determined. The Roughness Tester PCE-RT 11-ICA is a portable measuring instrument for determination of surface roughness according to Ra, Rz, Rq and Rt in just one device. The small roughness tester is especially designed for fast measuring of roughness. The roughness tester PCE-RT 2000 is used for accurate measurement of surface roughness. The roughness tester PCE-RT 2000 can be used on all surfaces. The roughness with the roughness measuring device is precisely recorded via the piezotast head. The roughness tester PCE-RT 2000 can be purchased here in our online shop. Roughness Tester PCE-RT 1200-ICA Incl. ISO Calibration Cert. The Roughness Tester PCE-RT 1200-ICA is used to determine surface roughness. The compact roughness tester is a handheld device for mobile use. Due to the power supply via a powerful battery, it can be used directly on site. The roughness tester PCE-RT 1200-ICA is used in the laboratory, in production and everywhere where the roughness of surfaces is to be determined. The roughness tester PCE-RT 2000-ICA is used for accurate measurement of surface roughness. The roughness tester PCE-RT 2000-ICA can be used on all surfaces. The roughness with the roughness measuring device is precisely recorded via the piezotast head. The roughness tester PCE-RT 2000 can be purchased here in our online shop. Meet ISO, ANSI, DIN and JIS standards with PCE-RT 2200, a portable surface roughness tester with an easy-to-read LCD display, large internal memory and convenient USB port. The roughness tester PCE-RT 2300 is used to measure the roughness of surfaces. The PCE-RT 2300 roughness tester has a detachable motorized sensor. This property allows the roughness tester to determine the surface roughness even on small or narrow profiles. Meet ISO, ANSI, DIN and JIS standards with PCE-RT 2200-ICA, a portable surface roughness tester with an easy-to-read LCD display, large internal memory and convenient USB port. Roughness Tester Hommel Etamic W10 is a portable instrument for measuring roughness. The roughness tester measures all common roughness variables according to international standards such as DIN EN ISO or ISO MOTIF. The Hommel-Etamic W20 skidless probe system has been designed specifically for mobile roughness measurement. It not only measures all common roughness parameters, but also evaluates the waviness and total profile of your surface. The measuring instrument is particularly compact and portable. Each surface roughness tester bearing the PCE Instruments brand name is delivered manufacturer or factory calibrated. Calibration certificates are available optionally for purchase. PCE-branded roughness tester devices are equipped with easy-to-read LCD screens, making them well suited for a wide range of industrial applications—from materials testing in the research and development (R&D) lab to quality control on the manufacturing floor. PCE roughness testers offer a long service life due to their resilient, heavy-duty construction. 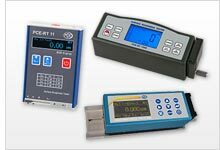 PCE roughness testers come in a variety of measurement ranges, resolutions and accuracies. Most feature rechargeable batteries and chargers as well as a handy carrying case. A number of accessories, such as specialized software used to transfer measurement results to a PC or laptop for further analysis, are sold separately.